This is a guest post by Lisa VanRaemdonck, Executive Director of the Colorado Association of Local Public Health Officials, and a member of the CCMU board of directors. Lately, I’ve been observing and thinking about the use of questions in my daily work. I appreciate the power of questions and am trying to employ them more effectively and regularly. Thus began my recent exploration of how we use questions in our interactions with each other and how we might use them more frequently and with greater impact. My unique educational and career path has armed me with a variety of experiences and perspectives on questions. Before the internet and our current media environment, I was trained in journalism and a style of questioning that solicited brief and descriptive answers that could be distilled into a newspaper article. My experience in peer coaching involved questioning that helps an individual find the nuggets of truth, direction, and motivation in themselves. As a facilitator of dialogue, meetings, and collaborative conversations, questions are valuable tools for finding and articulating shared meaning. In my most recent quest to better understand questions and their value, I began reading a book called Humble Inquiry. At the same time, I attended a training on Appreciative Inquiry and started listening to an audio book called Thinking Fast and Slow during my commute to work. The concepts and tools in these resources grounded me further in the need for generative questions to help explore partnerships and our collaborative work. It seems to me that the right questions can help us be more efficient and effective by sharing expertise and ensuring understanding before moving forward. The right questions can help us avoid duplication (as in, my organization already has the data you are trying to collect) and can help us build on programs and systems that already exist (as in, asking about what exists before building anew). And, the right questions can help us build better relationships and greater understanding. Questions can also be weapons. However, “gotcha” questions or questions that start with “Why did or didn’t you” are not the kinds of helpful, trust-building, and relational questions that further our work. In epidemiology, we think about surveillance or detection bias as the concept that the more you look for something, the more you will find it. So, with this new and renewed interest in the power of questions, I started looking around for them. I observed myself and my colleagues in our work in board meetings, coalition meetings, staff meetings, one-on-one conversations, and in general daily interactions. Alas, I found myself and my colleagues engaging in lots of telling and sharing but little genuine and generative questioning. I wondered if the environment of our meetings and the way we run them just doesn’t allow the time for carefully crafted and openly answered questions. 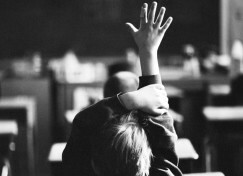 Perhaps we are also not taught in a way that helps us learn the skills of asking questions. Or, perhaps our society values proving that we know something over finding out what others know. This exploration has led me to believe that the best thing we can do for our collaborations is challenge our assumptions, approach each other with genuine interest and with humility, and start by asking a few questions. Inquiry can help us imagine a better future, together. I’ll end my reflection here, appropriately, with a few questions for you! How do you use questions in your organization and with partners? How would you like to change how you use questions? Do you or does someone you know have skills in the art of asking questions? What does that look like?